I have been working on a bar for just over a year now and there are a few thing that i have picked up on. 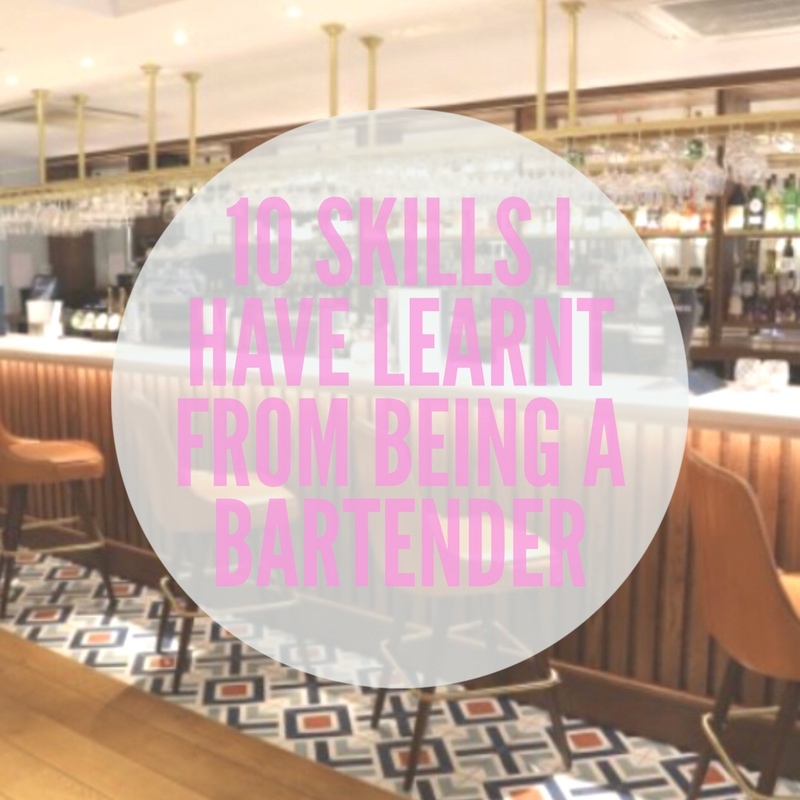 Here is a list of the top 10 skills i have learnt and how they effect working as a bar tender. Patience is key when working with the general public. It can sometimes be especially hard when the customer is intoxicated. This isn’t unusual with working on a bar so maintaining a calm, cool, collected persona is key. You have to learn to laugh stuff off and just get on with the job. This is an essential skill to learn when becoming a bartender. As there is always a queue for drinks, you need to be able to pour the drinks in question fairly quickly to get the next person served. Without quick paced working conditions customers will get annoyed and upset that they aren’t being served quick enough. No one wants to spend half their night at the bar. If you’re planning to become a bartender you will definitely need tough skin. This is because most drunk adults think its funny to make fun of you. Most of the time it is just ‘banter’ but sometimes they take it a little too far as most people have no filter when they are drunk. This can get you down if you cant take it but in the end you have to just brush it off and laugh along with them. I have never been the best at maths, even at school i struggled however as working as a bartender i have become much quicker and better at mental maths. The till can be used as a very useful calculator which makes doing the maths even quicker. Listening can be a hard skill to master when working behind a bar as it is very quick paced so there isn’t much time to stop and play therapist. However anytime the bar seems to be quiet it is always a good idea to have a chat and listen to some of the customers. This can be a great way to get to know the locals very well and may end up in you gaining better tips. It is very easy to get stressed when working as a bartender. This may be due to customers getting annoyed they have waited so long or customers changing their orders after you have poured all the drinks. The key is not to let it show or you can look very unprofessional and they customers wont be impressed. There will be some instances where you get an order wrong or maybe charge the customer incorrectly, however you cannot let this hold you down and you just have to move on. Once you have sorted the problem, move onto the next order and start a fresh. If you stay focused on what you have done wrong there is a high chance you may get distracted and keep making similar mistakes. Teamwork is one of the main skills you will learn when working on a bar. To get the job done quicker it always helps to work as a team, especially at the end of the night and all the cleaning, clearing and tidying needs doing. Teamwork helps get the job done quicker and more efficient. As a bartender you need to be able to talk to the customers and find out exactly what they want. It is no use if you cant get your point across clearly. Misunderstandings can result in wrong orders or customers getting annoyed. If you be persuasive you can end up making the business you work for much more money. For example you could try and persuade a customer to buy more shots or get a double instead of a single. This would show well to the manager you work under and may end up with you getting a promotion or more hours work. You’ve picked up so many skills! I bet you e got some stories to tell about customers. Looking forward to your coming posts! This list takes me back to when I worked as a bartender a couple of years ago. You do pick up a lot of skills very quickly! Great post.